(Phys.org) —A dog's breed can determine how well it follows human commands, according to a new study from Oregon State University. The study, which was published this month in the journal Animal Behaviour, found that dogs bred for predatory traits are better at following some human gestures. "The more we know about the predatory behavioral tendencies of dogs, the better we can predict how successful they might be with humans in different home and working environments," said Monique Udell, an animal scientist at OSU and lead author of the study. "This may allow us to make better placement, ownership and training decisions in the future." "We can set dogs up to succeed by capitalizing on each breed's inherent strengths instead of treating all dogs as if they came from the same mold," she added. 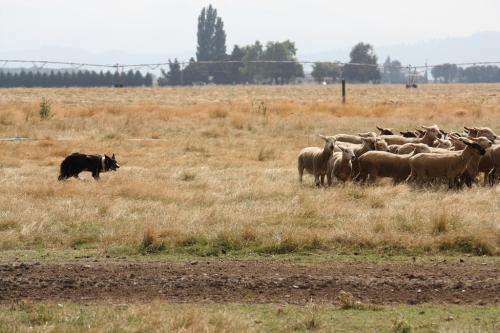 OSU tested three breeds of dogs used for specific purposes: hunting, herding and livestock-guarding. In an experiment, dogs watched a researcher point to one of two identical empty cans. If the dog then approached that same can, food was placed on it. The test was repeated 10 times. When choosing between the two cans, the researchers believe each breed drew on its natural predatory tendency to eye, stalk, chase and ultimately consume food triggered by movement – a pointing human hand, in this case. Border collies, the herding dogs used in the test, chose the correct can more than 85 percent of the time. Researchers credit their success to the fact that border collies have been bred for exaggerated eye-stalk-chase behavior, hunting traits which dogs inherited from their wolf ancestors. Airedale terriers also performed well, showing 70 percent success in tests. The hunting dogs have predatory instincts most similar to wolves and are extremely responsive to movement and inclined to follow it. "These breeds are perceived to have an uncanny ability to read people, like when they anticipate owners taking them for a walk," said Udell, who is also the director of the OSU Human-Animal Interaction Lab and an assistant professor in OSU's College of Agricultural Sciences. "What people are picking up on is a predisposition in these dogs to watch for movement and respond accordingly." Anatolian shepherds, the livestock guarding dogs in the tests, initially responded to human gestures less than 50 percent of the time on average—not a single individual performed above chance. This finding is consistent with their breeding, said Udell, because Anatolian shepherds have been bred for the absence of predatory traits to encourage them to protect instead of chase livestock. With additional training, however, Anatolian shepherds were able to learn to follow human pointing. Although researchers are confident that breed helps predict the success of dogs in following human commands, they also note that it is only one factor among many. "Behavior is not fixed," Udell said. "A dog's breed may simply signify a different starting point. If dog owners want their pets to behave in a way that is uncharacteristic of their breed, it is often possible, but may take more training and time. You can teach dogs – young and old – new tricks." How common is aggression in UK dogs? Can walkies tell who's the leader of the pack?